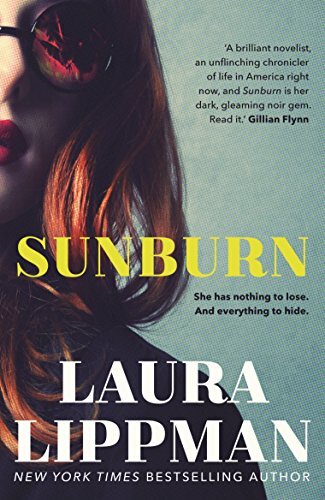 I read Laura Lippman's new thriller, Sunburn, already a month ago, when we were coming back from Crete. I started it in a plane and was almost sad when the flight was so short I couldn't finish it straight away. Sunburn is a very good crime novel, something Anne Tyler and James M. Cain would've written, if they had collaborated (Lippman cites both as influence in her epilogue): a woman, whom life hasn't treated fairly, suddenly (or so it seems) leaves her husband and three-year old child on the beach and moves to a Hicksville in Maryland and meets a tall dark stranger. I don't believe anyone can predict the twists and turns of the novel, especially the first half is very exciting and full of red herrings. The other half is totally different and moves along at a different pace, which some might think is a letdown, but I'm sure it's done on purpose. There's lots of good and excellent in the book, but I'll mention only two things or themes. Food and making it gets lots of display, but for once this is elementary to the plot and thematics, and not just some sentimental paraphernalia of most new crime novels with food in them. What's especially great is that Lippman almost never describes what her characters look like, but still you get a very full image of them. This happens, because she writes about what kind of an effect her characters have on other people. Lippman is very skillful in this. Highly recommended, also to Finnish (and Swedish and Greek and Italian etc.) publishers. Sunburn would make a fine addition to the other domestic suspense writers you've been translating and publishing for some years now. This is something entirely different from those dull Nordic noir serial killer doorstoppers: lean and mean and thoughtful, all this at the same time. Hardboiled with a feminist twist. You can't get more exciting than that.